Fern is one of the oldest plants which has been around for around 360 million years. They don’t reproduce by seeds, but rather with spores. They don’t have flowers, but their pretty and cleansing leaves make them valuable as ornamental plants. Here we will focus on the Fiddlehead Fern (Matteuccia struthiopteris, also called Ostrich Fern). Fiddlehead ferns is a very popular ornamental plants, but they also form big colonies in the wild. They like wet grounds, but dislike wind and hail. They can be found in riverbanks and sandbars. It grows from a completely vertical crown. The fronds are dimorphic and green, 100–170 cm, long-tapering to the base but short-tapering to the tip. The fertile fronds are shorter, 40–60 cm long, brown when ripe. They develop in autumn, persist erect over the winter and release the spores in early spring. Fiddlehead fern has pretty green tall fonds, and the brown fonds with spores from last year stand over winter until the next year. When harvesting for culinary use, the best are the young fiddleheads of the ferns (when the stems are around 15cm). But even if they are already grown, so long the fiddleheads are still curved, they will still make a delicious dish. The very new sprouts of fiddlehead fern are covered by a thin layer of yellow-brown ‘shell’ that can be easily wiped off. Important: when harvesting the fiddleheads, it’s essential that you don’t take too many from the same plant, otherwise you could kill the whole plant. The plants which are over harvested will also turn bitter. When cooking the fiddlehead ferns, you can steam them, boil them or fry them. Make sure to cook them for at least 10 minutes. Under cooked or raw ferns are not advisable for eating. Male fern (Dryopteris filix-mas, also called Worm Fern) can sometimes be mistaken as Fiddlehead Fern. But the difference between them are rather easy to recognise. Left: Male Fern. Right: Fiddlehead Fern. Male Fern has yellow-brown hair grwoing on the whole plant, including the stem and the head. They are part of the plant and can not be wiped off. 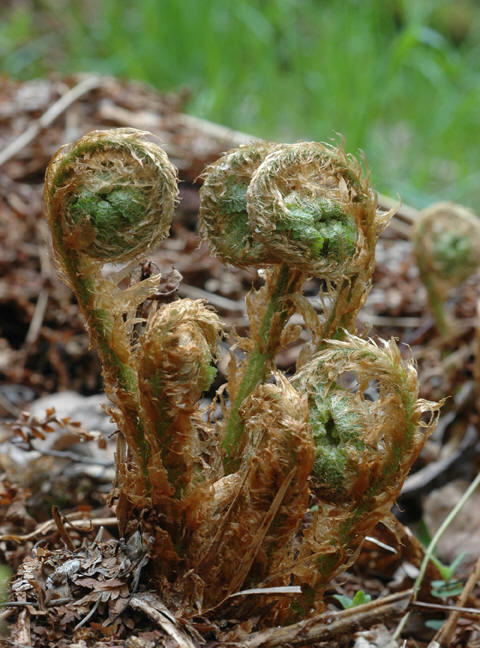 Fiddlehead Fern has clean green color and smooth stems. When they are very young, they are covered by a thin yellow-brown ‘shell’ that goes off very easily. 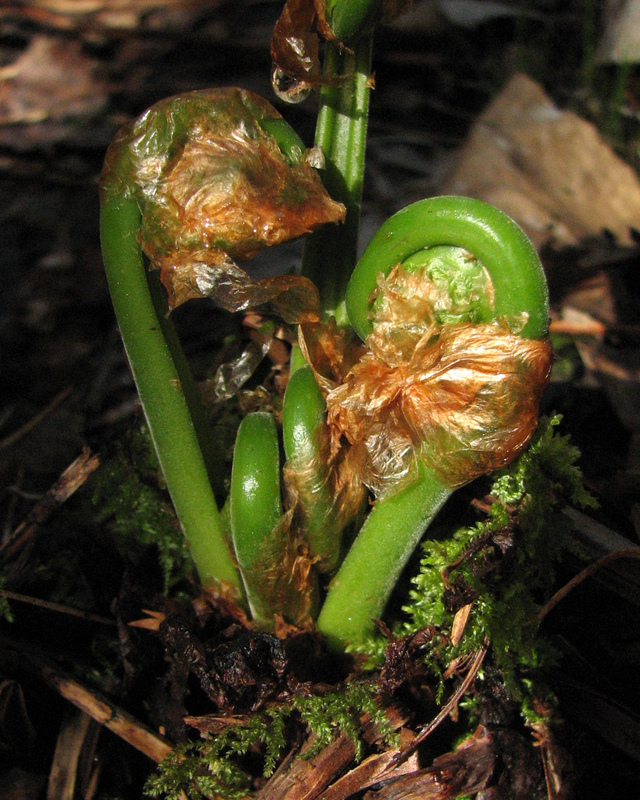 Male Fern has yellow-brown hair, and therefore is much darker and also hairy compared to the Fiddlehead Fern. Unlike the Fiddlehead Fern, Male Fern does not have spore fonds from last year standing. The brown spore sticks are good signs to look for the right fern.